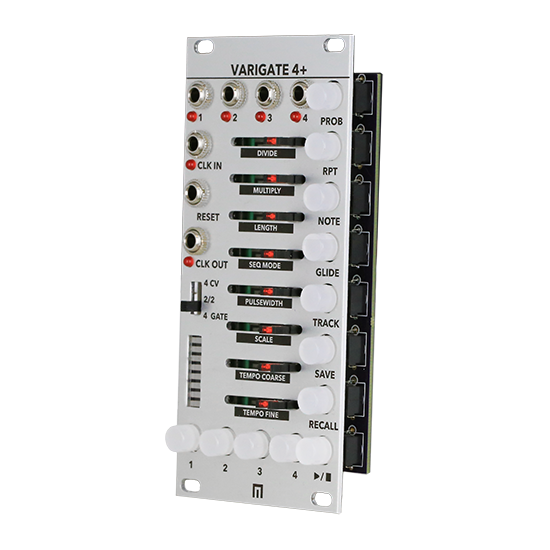 The Varigate 4+ is a 4-channel, 8-step sequencer that includes most features of the original Varigate 4, PLUS the new option to output both CV (quantized or unquantized) and gates simultaneously. 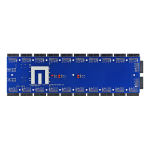 Other new features include a Play/Stop function, Preset Banks (4×4), Glide Per Step, Scales and can also be configured as master for the Malekko Voltage Block as well as a slave to the Varigate 8+ if you’re looking to expand your total channels and presets (up to 14 channels and 100 presets with V8+). 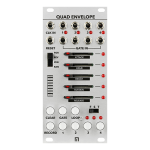 Each Channel (or Track) correlates with it’s own sequencer (so 4 independent sequencers). 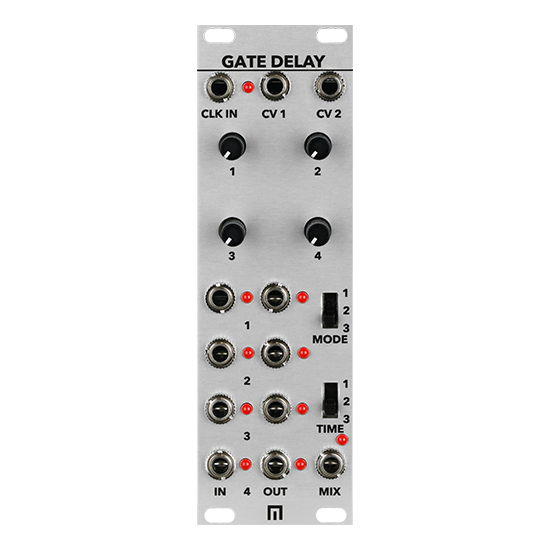 The addition of the Gate/CV Switch allows for switching between 4 channels of CV, 2/2 for 2 channels of CV and 2 channels of gates, or all 4 channels to output only gates. 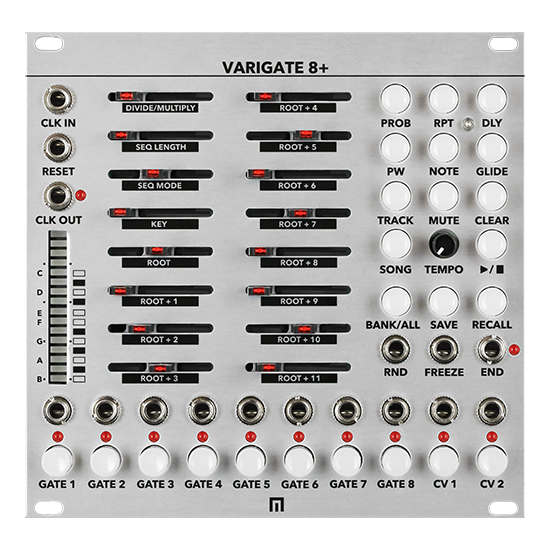 Additionally, each step of a sequencer can be programmed with Probability for gates, Repeats, Glide and Notes (when in a CV mode). There is a also a Randomization feature for Repeats, Notes and Glide. 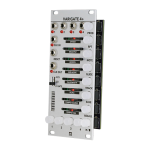 Channel parameters for Scales, Sequence Direction (Forward, Reverse, Pendulum and Random), Sequence Length, Division, Multiplication and Pulsewidth are all easily accessible using Track Mode. 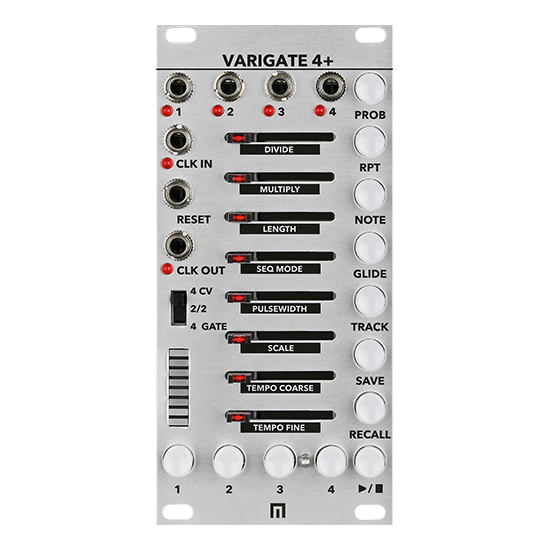 Easy Preset Recall makes the Varigate 4+ perfect for live performance. Pair it with the Malekko Voltage Block for maximum control! LEDs for A,B,C and D indicating gate outs, notes for each channel.